We have just released a WordPress beginners manual to help you get started so you can add content to your new WordPress website. The WordPress beginners manual will help you to get an overall understanding of how you use the various features within the WordPress Dashboard so you can add or edit content and keep your site or blog updated. 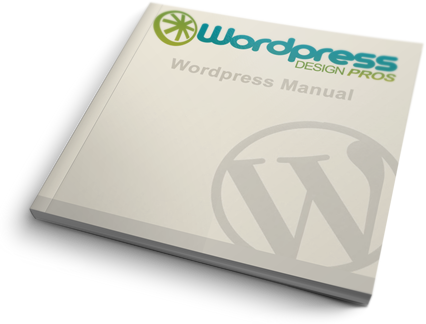 Please note that this Manual is not an installers guide it is purely intended for clients of WordPress Design Pros Ltd and covers the basics of using WordPress only. Click on the image above to download your copy today! Simon did an excellent job at developing our website and was very patient in incorporating all our changes. Everyone who has seen our website is very impressed with it! We would definitely recommend their work to others! I cannot say enough to acknowledge the speed, quality and value for money of your work. You are always more than helpful and a pleasure to do business with. I recommend you to anyone who will listen! These guys are easy to work with and very affordable. We used them to design our website. Very quick turnaround time on the work. Building a website was a scary thought for someone like me with little knowledge and experience in web designs but the commitment of Wordpress Design Pros has made the experience rather rewarding. I'm particularly impressed with their quick response time. The team at Wordpress Design Pros did an excellent job, when the design was being agreed they provided a variety of ideas which we then tailored to come up with the design that matched what we were looking for. I will definitely use them again. Hi Guys, Just a quick note to say how impressed we are with the service you provide. The new website looks fantastic. We really appreciate your patience whilst we made the various changes but we think the end result is worth all the hassle. Everyone comments on how great it looks and how user friendly it is. All in all, it is fantastic! Building a website was a scary thought for someone like me with little knowledge and experience in web design but the commitment of the staff at WordPress Design Pros has made the experience rather rewarding. I'm particularly impressed with their quick response time. I cannot express enough appreciation for what you have done for my company.I knew nothing about setting up and monitoring a website, but you made it so easy.I gave you my details, photo’s etc, checked your draft, then the next thing I know I am getting emails from new customers, all from your fabulous work! WordPress Design Pros provided a quality website which fulfilled all of my requirements. They are very creative, active and always available if you wish to contact them. I am very happy with what they have produced for me. Very recommended..
What impressed me about WordPress Design Pros compared to other companies was their first-class customer service and value for money. Maximum effort was put into every last detail, and as a result I've come away with a unique, innovative, and thoroughly professional website. We recommend Simon and the team at Wordpress Design Pros as we can categorically state that their approach to our project was both professional and friendly which was unique in comparison to other companies we have worked with in the past. "Our requests for elaborate functionality and adventurous designs are sometimes hard to convey by email, but our website was designed with amazing precision, and quickly considering what needed to be done. These guys really know their wordpress, and could meet all of our specifications with cutting edge solutions!" Having been familiar to Wordpress from a previous job I knew that this would be the best option. With a few of my ideas and Simons input I had my site up and running within a week. The look is modern, clean and very professional and I can not thank Simon enough. I recommend them to anyone thinking of having a website created. I highly recommend Simon and the team at Wordpress Design Pros. They produced a professional website that looks fantastic and exceeded all my expectations. I would recommed Wordpress Design Pros to anyone who has a vision and wants it to become a reality. A very big thank you to Wordpress Design Pros for their outstanding work on the site. No request, big or small, was too much trouble. We are delighted with the site and look forward to working with them on the next! We are thrilled with the finished product which is clean, professional and has already received many positive comments. What I appreciated most about working with Simon was his ability to interpret and evolve the website designs and content. He was able to keep everyone happy, and delivered the expected results and then some. Simon at Wordpress Design Pros has done an amazing job on my website. I had so many ideas in my head and he has managed to bring them to life. He always responds to emails instantly and any alterations were done within a very short period of time. I highly recommend these guys. Don't try to create your own custom website, let the pros do it for you. Such a small price for such a great site.